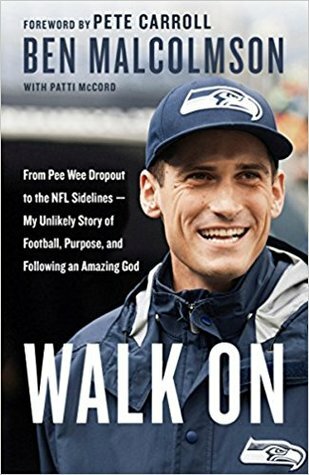 In Walk On, Ben Malcolmsom opens up about how he discovered his purpose and how God used him in unexpected ways. Ben was a journalist for the USC school newspaper, The Daily Trojan. He decided to secretly join the walk on try out for the Southern California Trojans football team to get a firsthand story about the experience of trying out. He hasn’t played football since he was ten years old. He was determined to never to play football again because he hated it. He also weighed only about 165 pounds at the time and wasn’t a big guy. He was only going to be trying out just for the story. But God had other plans. He was picked to be on the team partly because he was a fast runner and he believed that Coach Peter Carroll was playing a prank on him by selecting him to be a walk on player. It wasn’t a prank he did make the team and he made the roster for wide receiver. He was picked on and laughed at by a few of his teammates when they discovered he was a reporter. Throughout the book, he shared about how he loved to be a counselor at Deerfoot which was a wilderness camp for boys. He opened up about how his faith became real for him when he was a freshman. His faith helped him to be a witness for Christ on the football team even while encountering setbacks and challenges. He injured his shoulder again and was kicked off of the team. He had to choose to preserve and fight for his spot back on the team. Readers will strongly be encouraged and their faith will be strength by reading about how Ben found his purpose and how God used him. I would recommend this amazing book to anyone who enjoys reading a story about adversity and overcoming the odds despite the fact that the odds are against you. I haven’t ever heard of Ben’s story prior to reading this book. I connected with the fact that he was a new reporter and was considered to be unqualified to be a football player. But he found his way amazing placed on a football team. I loved how he included special thoughts and scriptures at the end of all the chapters. He had great takeaways about being on the sidelines and still believing that God has a hope and a future for you. I really enjoyed reading this book about his journey through his news writing career and how everything lined up the way it was supposed to. If you’re a looking for a great summer read, then read this book! In Poverty, Riches, and Wealth, Kris Vallotton discussed the topic of prosperity and how many believers are suffering from limitation and they don’t believe they will ever rise above their current level in life. He opened up about how in his own life he lost his father at a young age and they had to rely on social welfare programs to get by and they were poor. Later in life, he and his wife also owned nine businesses and he would warn his children about the dangers of wealth and he still struggled with his poverty mindset. They eventually became pastors at Bethel Church and they were being financially blessed and he admitted to struggling with feeling like people were judging them for how they were being blessed. He shared that someone helped pay off his house. He wrote this book to guide readers in tapping into the Kingdom’s wealth. This includes believing in the impossible and believing God is able to exceptional things, and believing that God will give you the resources to help bless others. I would recommend this amazing book to anyone who is ready to move out of a spirit of lack and they are ready to believe for better things. I liked how the book went over how God sees us and how we are His son or daughter and we are seated next to Him at His table. He also shared how we need to ask for forgiveness and receive His forgiveness. Vallotton looked at how we see ourselves affects our view on poverty and prosperity. He also explored how we have to have the capacity to receive our blessings and he uses the story of the three men who all received different amounts of talents and how two of them invested and one man buried his money. He shared that the faithfully was blessed and they prospered. 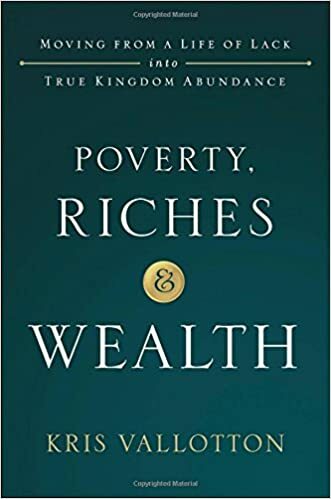 If you’re looking for a new book about prosperity, then read this book!